Traveling to a foreign country is always a little nerve-racking, whether its your first time or 100th time. And if you’re heading to a country that doesn’t speak your language, it can be very intimidating. Don’t worry! It’s not as scary as it sounds! You don’t need to know any Italian or study Italian culture to make the most of your trip to Italy. Here are some tips to make your trip stress-free, and the lovely people of Italy will take over from here! 1. Italians are super friendly! Don’t be afraid to ask for help. Think you might know how to say it in Italian? Go for it! Just the attempt at their language makes them happy, and it will be quite obvious that you actually speak English, inviting them to do the same. Italians begin learning English at a young age, generally in elementary school, and many probably speak it better than you do! 2. Bring lots of Euros. Think you know how much cash you need? Double that. And then some. You can always bring it back or save it for your next trip. One of the things that makes Italy so amazing is their old world culture, This includes a lot of places still only accepting cash! Most of Italy isn’t very expensive (our favorite pizza and two Peroni’s in Naples cost under 10 Euros) but it adds up when you are used to whipping out the credit card. The foreign transaction fees on debit bank cards is usually outrageous, as is the cash withdrawal fee on a credit card. Save that money for something better than fees (like more pizza!). If you do end up needing more cash (like we did), go to the cash advance stores. You know, the skeezy looking places that are just a small room and a man behind what I assume is bulletproof glass. They charge your card like a regular purchase and add their own fee on to it. It was significantly less than Bank of America’s foreign transaction fee and Chase’s cash advance fee. And make sure you have change. I’m talking coins. Most public restrooms charge a fee to enter. You don’t want to be stuck outside of the bathroom because you don’t have a Euro coin to get in. 3. Book tours to popular places you absolutely must see while there. You know how badly you want to see thee Sistine Chapel? So do the thousands of other people that are planning on going the very same day you are! Book a before or after hours tour for the places you have to see. You’ll be guaranteed to see the things that are most important to you, and it the best conditions possible. 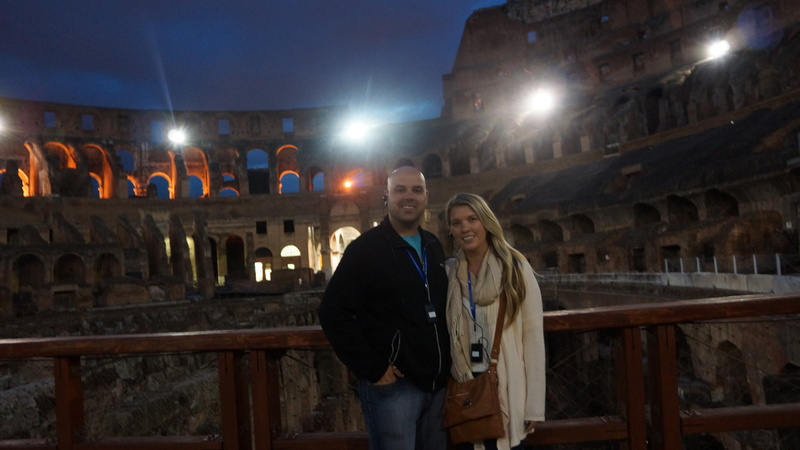 We saw the Vatican before it opened and the Colosseum after it closed to the public and it was amazing. 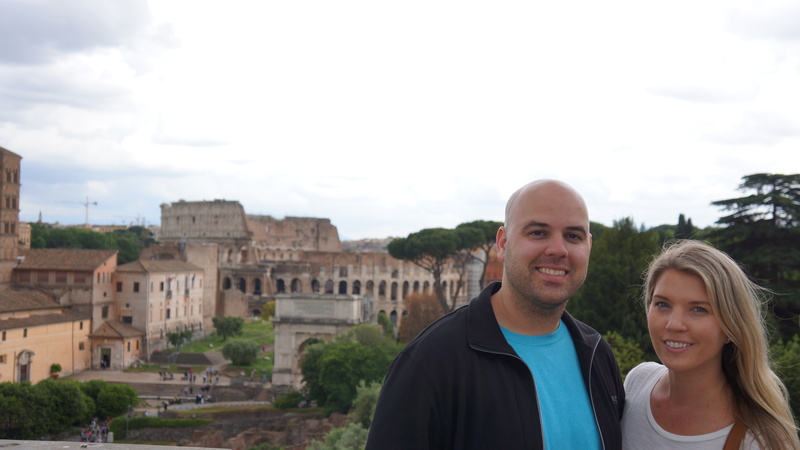 Walks of Italy has great tours and every guide we had was super knowledgeable. See how empty it is after hours? Don’t be afraid of the train. The trains are frequent, easy, and comfortable. 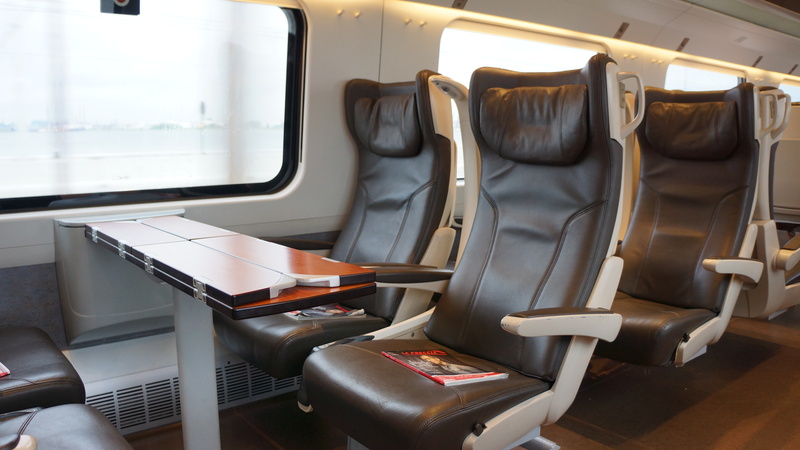 Book first class tickets when you can and you will fall in love with train travel. The seats are comfortable, there is more room to store your luggage. They don’t check your bags. You have to haul them up in the train and find a place to put them. Some trains have luggage racks, others have just enough space between the seats to store your bags. An attendant brings you drinks, snacks and a newspaper. Coach is just fine too, but you may find it a little more stressful. It’s more crowded and not as much room to store your bags. And you’ll have too go find your own drinks and snacks (tough, I know). No matter where you sit, get on the train as soon as it arrives. Most stations have a large monitor in the center that tells you which track each train is at. When you get to the track there is usually another screen that displays which train it is and where it’s going. Each carriage tells you which class it is, which section, and where to get on for each seat. If you are running late and the train is about to leave, just get on and then find your seat. The trains do not mess around when it’s time to go and they take being on time pretty seriously. The newer trains have automatic doors in between each carriage, you just have to wave your hand in front of the sensor. I’m mentioning this because I had a hard time figuring out. I had to wait for someone else to go to the bathroom before I could go. If you are taking a local train without a seat assignment, make sure you validate it at the station! There are instructions on the back of thee ticket indicating which what to punch the ticket and all you do is stick that end in the green machine on the wall before getting on the train. Don’t validate it too far in advance, as it’s only good for a certain time period. Never been on a train before? 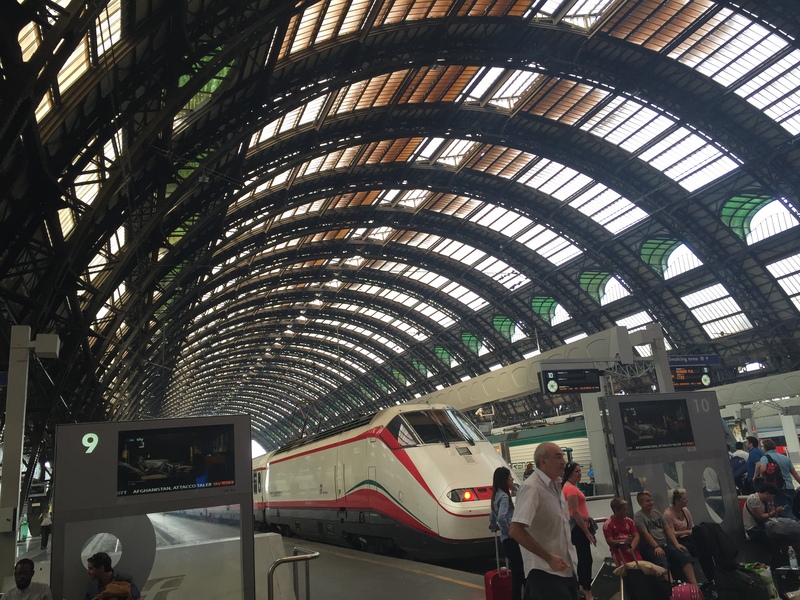 Make sure you read my Tips for Train Travel before going! First class seats and the train station in Venice. Italians will spend hours eating one meal. They will order a bottle of wine, a plate of pasta, another bottle of wine, a salad, more wine, the main dish, maybe more pasta, more wine, and dessert. It’s an amazing experience eating like an Italian. But as soon as you are done, leave. Other people need the table so they can have the same experience you are. And if you have leftovers, too bad. If you are at a touristy place (which I highly suggest you avoid) or God forbid a chain (why would you go to a chain in Italy???!?!?!?) then you can probably get a to go container. But if you are at a truly authentic place, a place where the locals go, then only order what you can eat. Most places do not have leftovers and probably don’t have boxes. 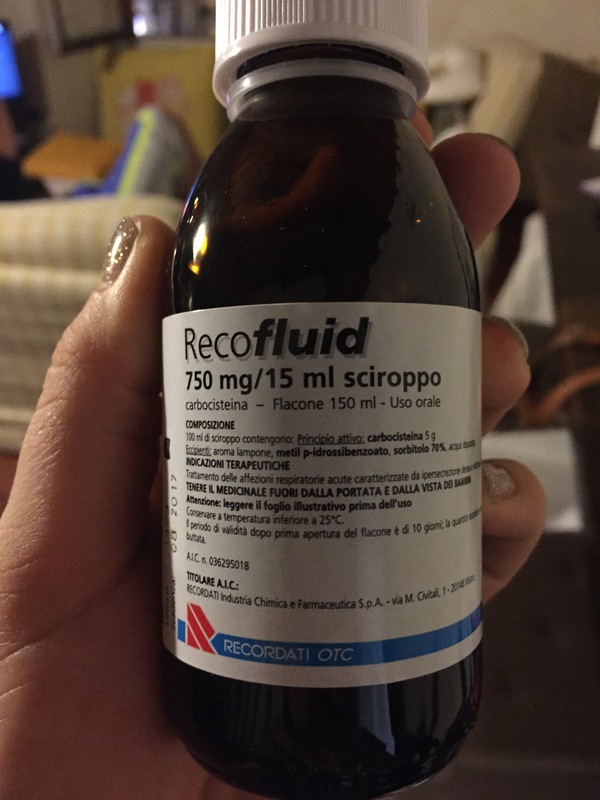 A nurse I work with asked to bring leftovers back to her hotel in Italy and they gave her a ceramic plate and made her promise to return it the next day! Italians will always try to accommodate you, but it’s better to try and follow their customs when in their country. I’m a nurse and the Husband is a physical therapist, so luckily we already think in military time. So if you don’t know it, learn it. It’s really quite simple. If it’s 1:00 AM to 12:59 PM, its the same. 1:00 AM in 0100 in military time. 12:01-12:59 AM is 0001-0059. It’s the zero hour of the day. 1:00 PM-11:59 PM is just the time plus 12 hours. so 1:00 PM is 1300. 11:59 PM is 2359. The midnight hour is a little tricky; it can be 2400 or 0000. Generally, you will see midnight as 2400 and 12:01 AM as 0001. Turns out it really was cold medicine (that tasted delicious) and helped me get through my cold without missing any travel time. But it would have been so much easier if I would have just remembered the Dayquil when I was packing. 8. Bring a reusable water bottle. Most cities have water fountains everywhere. The water is clean and delicious and will save you 1-2 Euros each time you fill up. Don’t be afraid to drink from them (except Naples. Don’t use anything public there). 9. Don’t look like a tourist. Although I didn’t have any bad experiences with pickpockets or crime of any sort, I’ve heard some terrible stories. Don’t be one of those stories. Unless you are actually Italian, you will look like a visitor. No one but Italians can pull of the Italian look. But you can be less obvious. No fanny packs (ever, actually. If you have one, get up right now and throw it out). Avoid backpacks too, unless you are actually going to school. Wear a cross body bag that you can keep in front of you. Try not to wear a camera around your neck, especially a high quality (read: expensive) DSLR. Not only will you be obvious to any thief, but it’s also not good for your spine. And please, for the love of all that is beautiful and amazing in Italy, don’t use a selfie stick! Not only do you look absolutely ridiculous, it gets in the way of other people trying to capture their own memories (and they are starting to be banned anyway). Chances are there is a tourist couple nearby that will take your photo in exchange for taking theirs, and they won’t try and steal your camera. A nice couple on vacation took this for us. So much better than with a selfie stick! These nine tips should help make your Italian trip less stressful and allow you to focus on just how amazing Italy is. Happy travels!